Three-day eventing has undergone a rash of deadly accidents over the last few years, prompting sport organizers to clean up eventing’s safety record. 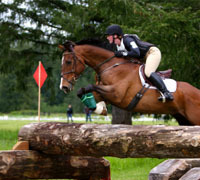 Nearly all accidents occur during the cross-country phase of eventing, so that’s why a group of cross-country course designers, including United States Equestrian Federation (USEF) President and licensed course designer David O’Connor, are committing their time and effort to the sport’s safety. O’Connor and other course designers and builders are joining with faculty and students at the University of Kentucky, forming a multidisciplinary team to develop and demonstrate additional frangible technology for cross-country fences. Frangible technology, often referred to as “breakaway fences,” is not as simple as making fences that fall down when impacted. Ill-designed frangible technology can cause more problems than it is intended to prevent, according to the experts. Good engineering is part of developing the best—and safest—technology possible. The newly formed team expects to build on the prior work of the Transportation Research Laboratory and Bristol University in Great Britain. The plan is to evaluate prototype and full-scale jump concepts that course designers and course builders are developing. To help fund the effort, the USEF has launched a fundraising campaign to raise money in support of the program. The USEF has set a goal of raising $150,000 to support the project. To make a donation to the Frangible Technology Fund visit: www.usef.org/_AUAIFrames/DisasterRelief/Frangible/Frangible.aspx. Good. One of my closest friends is an eventer and I’m glad to see that they’re making things safer for her and others. You know what though? If it saves 10 people’s/(or) horse’s lives every year that’s still not enough for me or any other caring horse owner/lover. It’s saying instead of making the courses easier on our horses,let’s make them harder,but collapsable. It makes no sense to me that THIS is all they’re doing. They should do MORE. I’m glad they’re making an effort to make it safer. That’s great that they’re making things safer. Safety is the most important factor in sports. Keep up the good work!